Within an oasis called Minerva Park, Ohio, gutter guards sit atop an updated midcentury modern ranch home with a large, heavily wooded yard. The trees scattered throughout the yard include some of the worst offenders: oak, locust, and maple trees that drop tassels, tiny flowers and helicopters by the bushelful every spring. By the time we arrived on the scene, the spring blooms had given way to summer heat, but there were still remnants of the tassels clogging the openings into the gutters. The homeowners installed GutterHelmet gutter guards on their home in the mid-nineties. At the time, micromesh gutter guards had yet to be invented, and solid gutter covers were the predominant professionally installed gutter guards available. They purchased the top-of-the-line gutter guards of the time and have been pleased with its overall performance. We see lots of homes with 25-year old gutters, but not many homes have gutter guards that old. The homeowner had a new roof installed a few years ago, and that’s where their problems began. GutterHelmet installs over the 1st and under the 2nd course of shingles. 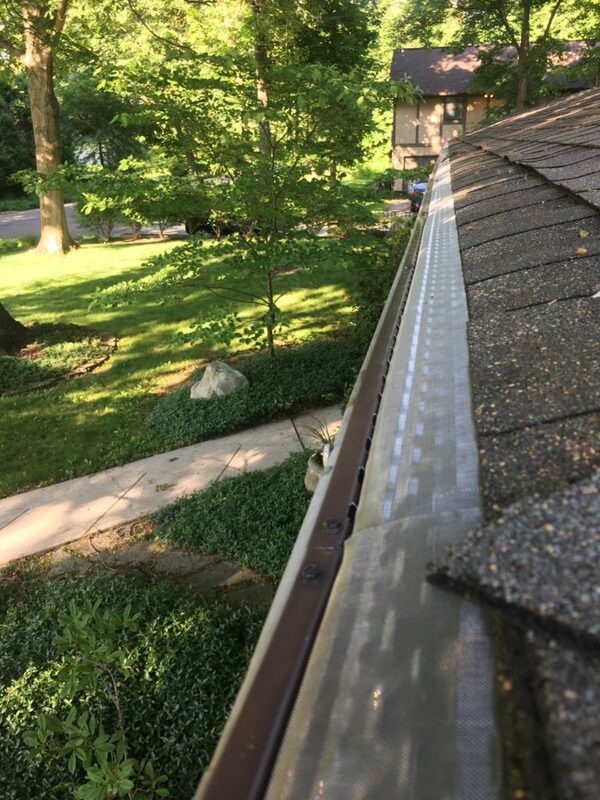 Homes with this type of gutter guard need to have the gutter guards removed before the new roof is installed, otherwise the roofers cannot access the first course of shingles and the home will be left with different colored shingles around the perimeter of the home if the guards are later removed. In this case, it appears that the roofer removed the gutter guards and reinstalled them after they installed the new roof. 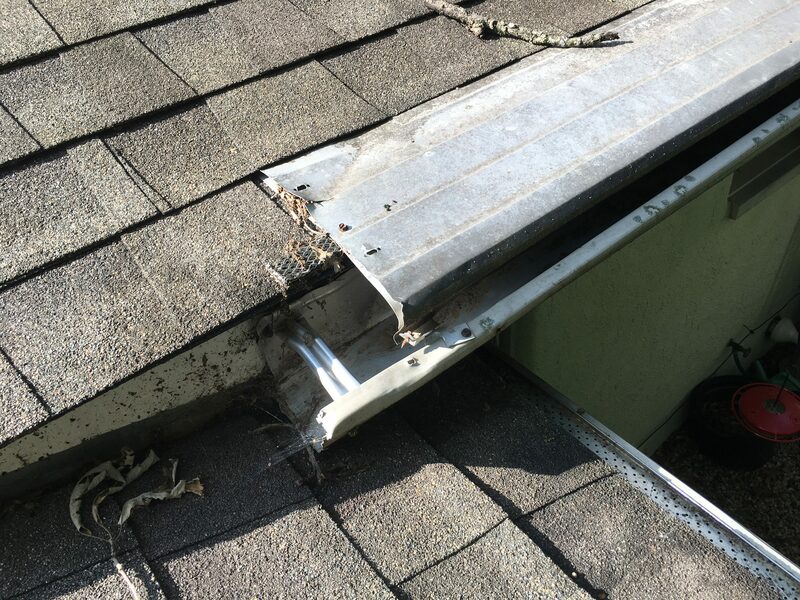 Unfortunately, the gutter guards were reinstalled improperly and the gap between the guard and the gutter opening was inconsistent. In some cases there was ample opening to allow water to enter the gutters and in other instances the guards were pressed against the gutter lip — effectively closing off the gutter to water. 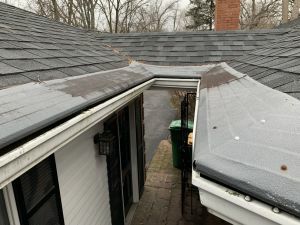 At some point the homeowner added an enclosed porch on the the back of the home, and in order connect the rafters to the house, the contractor removed a section of the existing gutter and gutter guard. What had been a continuous section of gutter was now two ends. 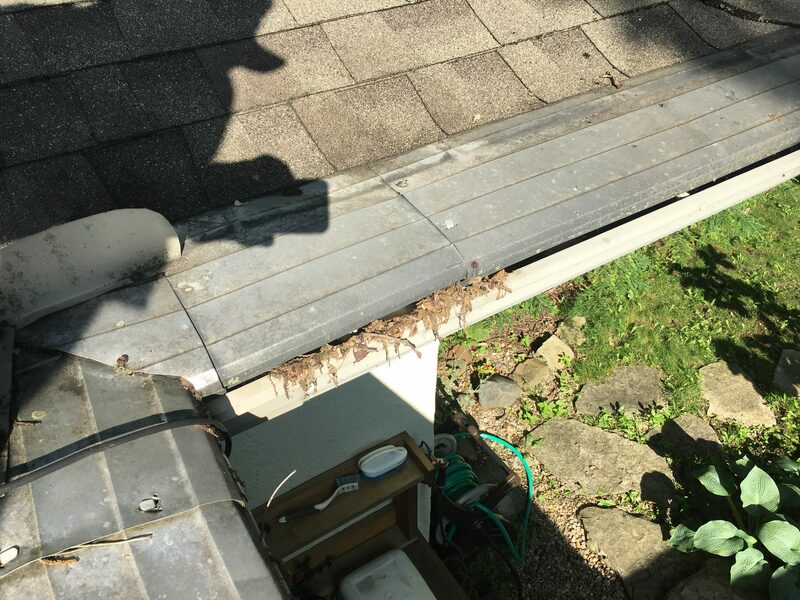 The contractor never placed end caps on the gutters, so squirrels were free to access and nest inside the gutters. Due to these issues, the homeowners decided to shop for new gutter guards. They met with the local GutterHelmet dealer but they wanted to go with new technology — something that would encapsulate their gutters. They liked our Gutter Rx system, but we determined that the size and proximity of the trees to the house would require more maintenance. They ultimately chose MicroScreen US because the fine mesh screen will keep all leaves, oak tassels, and maple seeds out of their gutters. They also liked the idea of MicroScreen’s under shingle installation in order to maintain a consistent forward slope while directing water into the gutters. The roofers nailed GutterHelmet under the shingles, which is a no-no that could void a shingle warranty, so it took several hours to remove the existing gutter guards. 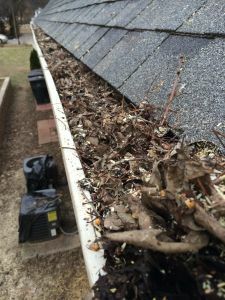 There were a handful of areas around the gutters where leaves and debris had built up, but much of the clogging occurred at the gutter mouth opening. Oak tassels collected and hardened at the opening and prevented water from entering into the gutters. Once we uninstalled the gutter guards, we removed all leaves, and rinsed out the gutters and downspouts; we added two new end caps to keep squirrels and birds out; we resealed several inside and outside corners that were leaking, and we installed MicroScreen US gutter guards. 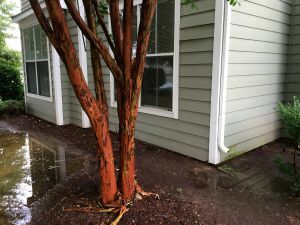 The homeowners waited for rain, and after a deluge, called us to say that the new gutter guards were working much better than the old system.